There have been heavy snowfalls over the weekend in New Zealand with up to 50cm of snow reported and drifts up to a metre deep. It's about six weeks until the first ski areas are due to open in the country for the 2018 ski season in the southern hemisphere, so the snow is too early for skiing, but is being taken as a good sign by ski areas in the country. After the huge snowfalls in the French Alps this winter, Val d'Isère, which closes for the season next Tuesday May 1st, has announced it will re-open a couple of its winter lifts for summer skiing this year. Although Val d'Isère is one of three French ski resorts still offering summer glacier skiing, this will be the first time in the famous resort's 82-year history that some of the winter pistes, just above the resort, will re-open in summer. Note :- this will be our final weekly report of this epic season, but we'll be back next week with the first of our monthly round-ups which run until the snows come again to the North. Most ski areas in the northern hemisphere have ended their 2017-18 ski season or will do this weekend or next. But Norway has three 'summer only' ski destinations and the first, the Fonna Glacier, is scheduled to open for its 2018 season this Friday at 10am. Nevis Range ski area is the third of the five Highland Scottish ski areas to decide to end its ski season. The resort close to Fort William and Britain's highest mountain Ben Nevis on Scotland's West Coast had previously said it intended to stay open until May 7th but said today that the rapid thaw of the past 10 days had taken its toll on snow cover. Several ski areas in North America have announced they're extending their ski seasons ? in some cases in to May ? following heavy snow in the past week in ski regions from Colorado to Maine. Winter Park in Colorado which was due to close today has announced it will stay open a further fortnight with its Mary Jane terrain lift-served until May 6th following more fresh snow there last week. It joins Loveland which had already planned to stay open to that date and A Basin which will be open at least in to June in Colorado. Several ski regions in Colorado are suing two oil companies for, what the ski regions say is damage caused to their communities by climate change, which they blame on the oil companies. The move follows similar suits filed earlier this year by the cities of New York and San Francisco against BP, Chevron, ConocoPhillips, ExxonMobil and Royal Dutch Shell on the same grounds. 200 northern hemisphere resorts still open, but warming temperatures bringing Spring skiing to high altitudes now. Research by J2Ski.com has found that more than 50 of the world's leading ski areas plan to stay open in to May. There are likely to be many other smaller ski areas doing likewise. Skiing and boarding will continue to be possible at resorts in Austria, Finland, France, Germany, Italy, Norway, Sweden and Switzerland as well as Canada and the USA. Portugal's only ski area, Serra da Estrela, will be closed again this weekend, but not because the snow has melted away at the end of the season, but because another huge snow storm has one again buried lifts and slopes. The ski area has had a remarkable season, with repeated heavy snow storms closing slopes and burying lifts over and over again. Scotland's five Highland mountain snow sports centres have already seen more skier visits than in each of the past three seasons, and are likely to stay open to May, trade-body Ski-Scotland reports. "It is turning into something of an epic season," a Ski-Scotland spokesperson said, "While by no means the best in recent memory, the skier day total for all five resorts surpassed 202,000 last weekend, 7/8 April. That is ahead of both seasons 2015-16 and 2014-15 and not far behind the same point in the 2013-14 season." Winter 2016-17 had low skier numbers too. Exceptional April snow cover in Tignes, France, open until 6th May. The snow has begun falling in the Alps again today with quite substantial accumulations expected at many resorts ? open or closed ? by the weekend. Up to 80cm of snow is forecast at some resorts in the Alps with smaller accumulations, although still potentially 30-60cm of fresh snow ? expected in the Dolomites and Pyrenees. It's a very snowy end to the season in Colorado with most of the state's ski areas receiving around two feet (60cm) of fresh snow in the past 72 hours, Copper Mountain the most reported at 69cm. Arapahoe Basin is pictured above this weekend. [b]There has been lots more fresh snow in the Alps over the past 48 hours, still building on bases that are at 'historic highs' of up to 7 metres. The Swiss side of the Portes du Soleil reported 25cm more snow in the past 24 hours, Bormio in Italy 30cm (a foot) and Morzine 40cm (16 inches). The Swiss area of Les Marecottes (pictured above) claimed the biggest total snowfall since Wednesday of 46cm. It closes for the season this Sunday. Engelberg this morning... where snow is up to 7 metres deep! More snow fell this week, in Europe and America. Engelberg is reporting the snow depth on its Titlis glacier slopes have reached 7.7m (nearly 26 feet) ? a leap of nearly 1.2m (Four feet) compared to a week ago. 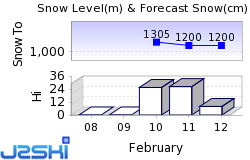 The Central Swiss ski area says it has had 145cm (Nearly five feet) of snowfall over the past five days.